Happy Holidays! I blame my lack of writing on busy holiday schedules and Mercury being in retrograde. Since both are near an end I thought I’d sit down and think about my blog. I’ve been reading various sports psychology books and articles and I keep coming across the benefits of visualization when it comes to succeeding in your sport of choice. It seems that every author on my reference list (see my list below!) has mentioned it in their books. Climbers, of course, are notorious visualizers. You can see them at every crag and gym "reading" the climbing route before they get on it; carefully planning each move to avoid falls and planning out crux moves. You can tell their doing it when they stand at the base of the route with their arms in the air mimicking moves like a pantomime. For those of you unfamiliar with reading a route it’s done by imagining each move (where your hands go, where your feet go, how the move will feel in your body) before you get on the route in hopes it will help you climb it without falling. The thinking goes that if you can’t imagine a climbing move then you’ll probably fall there. More than likely this is the crux for you and you should stop and study that part of the route and not climb it until you have a plan that makes sense for you. But does visualization really work? Or is it a crutch you shouldn’t lean on? And is there a wrong way to visualize? My answers are yes, yes and yes. I can say visualization works from a research perspective but I know for sure it works from a personal perspective. I read routes to feel more in control of the route – and myself. By looking ahead I feel like I can emotionally prepare for what the route is going to throw at me. When I’m outside I feel like looking ahead helps me see any potentially unsafe parts of the climb where I probably don’t want to take a fall (ledges, etc.). If I’ve visualized it then I feel like I can move more confidently through the moves and save my mental energy for the crux. For me, visualization has also contributed to many “flow” experiences that I’ve talked about before. It sets me up to start out in the “control” section of the flow chart and gives me a greater chance of my climbing experience bumping up into that all mighty flow section. 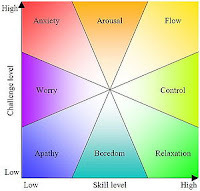 At the very least, visualization keeps me from being in the “arousal/anxiety” sections of the flow chart and that’s worth a million bucks. So why do I say you shouldn’t rely on it? While planning the route is great you also need to have the ability to be flexible while on the route. If you read the route one way and that way didn’t work then you need to be able to rethink an alternative move on the spot. It seems that climbers tend to either feel comfortable reading the route ahead of time or just climbing and reading along the way. It’s like the difference between chess players and basketball players. Chess players plan moves ahead, basketball players think on the spot. Or maybe climbing is like a hybrid of the two? For me I tend to read the route only when I perceive it to be difficult. If I think it’s an easy route I won’t read it ahead of time. Either way, it seems that climbers tend to be divided on whether or not you should read routes. Each camp thinks their way makes for a better climber. I say use it when you need to and also practice deciding on the spot. And finally, yes, there is a wrong way to visualize a climbing route. You have to let your instincts guide your visualizations. If you get too much into your thinking head and out of how your body feels then you won’t visualize a move that makes sense when you get there. Over thinking moves, or worse, 2nd guessing yourself, will sabotage your efforts. So even though I say “visualize” the moves – I really mean “feel” the moves. Happy New Year! Got any climbing resolutions to share?